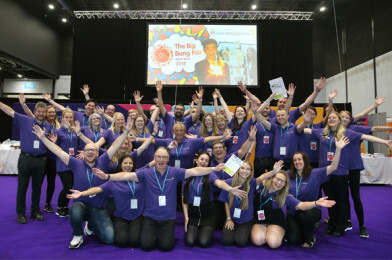 Big Bang North West 2019: Sponsor & Exhibit – Play Your Part! YES! You could be a part of the biggest STEM celebration in the region! Are you a business or organisation looking to sponsor a high profile event? We’re looking for companies to partner with us to inspire and engage the next generation of STEM professionals… and that could be you! Perhaps you’re an activity provider, educational institution, performer or show organiser who would like to play your part in our 2019 event. We have an arena, stands and a stage waiting for you. The Big Bang North West is exciting, fun and inspirational and our sponsors and exhibitors love being involved. We are always overjoyed to hear their fantastic feedback and our videos say it all… take a look. The Big Bang North West 2019 is coming and we’re so excited to be hosting it, it’s going to be HUGE! But to make it the biggest and the best, we really do need your help. We will have up to 8000 children and professionals attending on the 2nd of July at The Exhibition Centre, Liverpool. Along with the outreach/marketing opportunities and benefits to you, you’ll be helping to develop young minds and encouraging their love of all things STEM – creating the thinkers of the future! So, what are you waiting for? We have sponsor & exhibitor packages available at every level. Take a look our sponsor opportunities and let’s make it happen! Email our Events Manager [email protected] or call us on 0151 527 3823. We’d love to chat to you about how you can play your part!